Good oral care is part of a healthy lifestyle. A simple routine of brushing your teeth and flossing at least two times a day, establishing good eating habits, and having regular dental visits can help prevent tooth decay and prevent periodontal (gum) disease. At Finley Dentistry we want to assist you to understand the importance of regular dental cleanings and exams to help prevent tooth decay and gum disease. Your teeth are covered with a sticky film of bacteria called plaque. Plaque that is not thoroughly removed with brushing and flossing can eventually harden into tartar. Plaque and tartar that is left on your teeth can irritate the gum tissue and cause it to be red, puffy and bleed easily. Healthy gums do not bleed when brushing or flossing. Gingivitis is an early stage of gum disease, recognized by bleeding gums that can be reversed with the help of your Dentist and Dental Hygienist and a professional teeth cleaning, as well as good oral hygiene at home. If left untreated, gingivitis progresses to periodontal disease, which destroys the surrounding bone. This can result in infection and tooth loss. 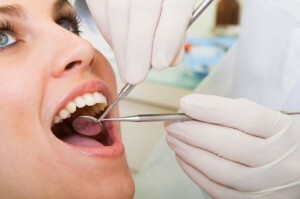 At Finley Dentistry our Hygienists are well trained in removing tartar. They are also thorough and gentle. We would love to help you keep your teeth and gums healthy. We all would love to help you keep a beautiful and healthy smile. Never miss a special deal again. Get the news when it happens! © Copyright Finley Dentistry. All Rights Reserved. Site by Duffweb.